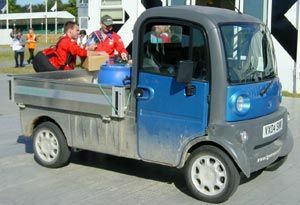 A more traditional entrant in the annual Soapbox Challenge downhill race, which as usual provided plenty of thrills and spills! Bugatti and Maserati side by side in the Paddock. 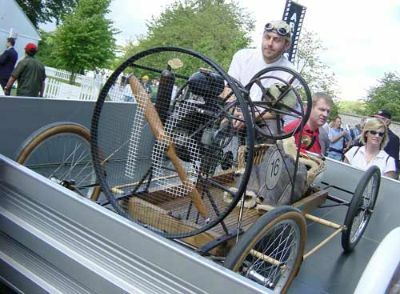 Ford Model T 'The Golden Ford' - restored 1911 2.9 litre 4-cyl Brooklands race car. 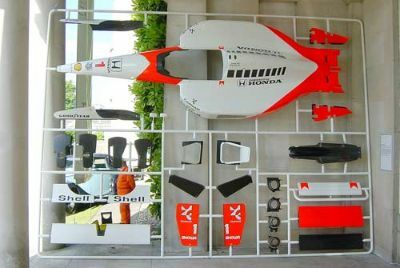 Concept car based on the 50's salt lake racers which were made from old aeroplane auxiliary belly fuel tanks. 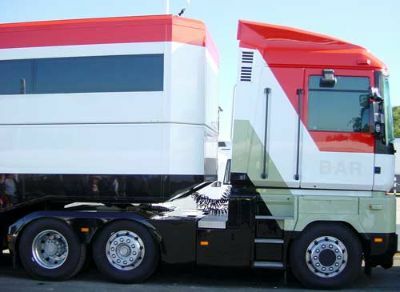 BMW people unloading ex-Nelson Piquet M1 race car from a transporter. 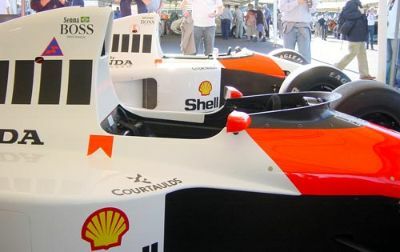 McLaren are one of the many big teams that attend Goodwood annually, with current and historic cars from their collections. 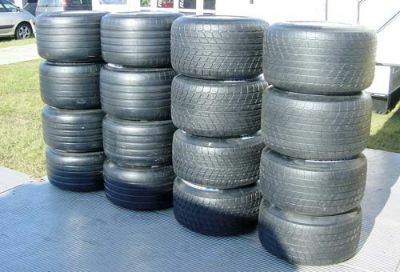 Michelin F1 tires, showing the dry 'grooved' tires on the left and wet weather tires on the right. 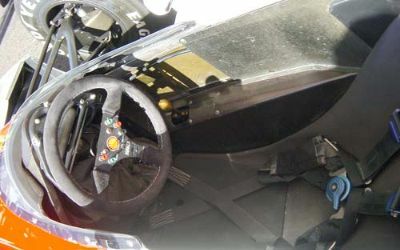 Not sure if these are intermediates or full wets. 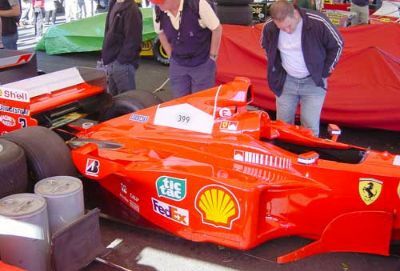 Ferrari well represented in every era that they have raced. 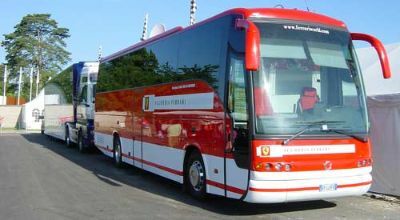 Another immaculate F1 transporter, in this case from Ferrari. 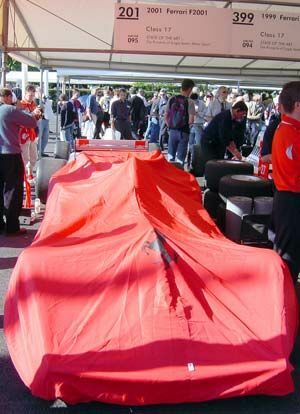 F2001 Ferrari F1 car under its covers early in the morning. 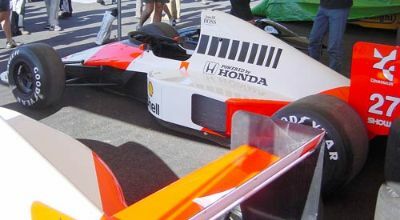 1999 sister car parked next door - you can see how good the access is to these famous cars. 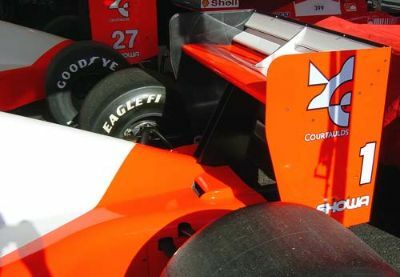 Detail of the F2001 car. 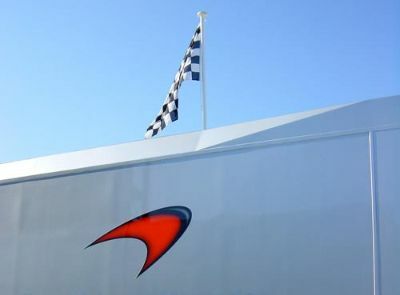 The current team were elsewhere in the paddock with a more recent F2002 F1 car running up the hill in the company of BAR, Williams, Jaguar, Jordon, McLaren and Renault. 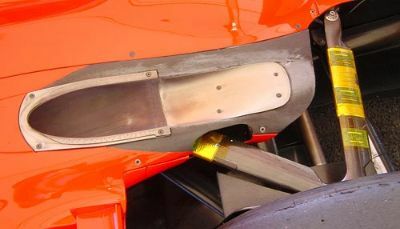 Top-exit exhaust on the Ferrari, showing the gold heat shield and temperature indicators on the wishbones. 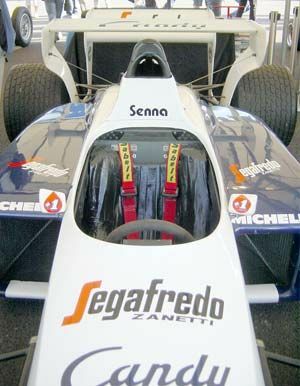 There was a large collection of ex-Senna cars there from McLaren and others. 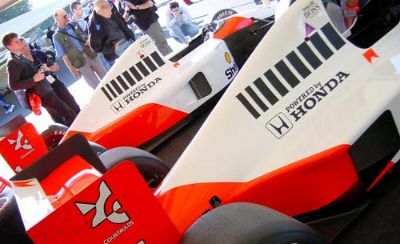 McLaren-Honda MP4/5B and MP4/6 from 1990/91 line up side by side in the Paddock area. 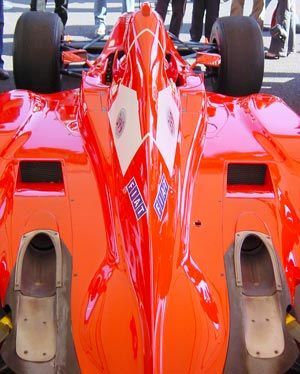 You can almost climb into the cars - no where else can you get so close to so many unique and historic race cars. 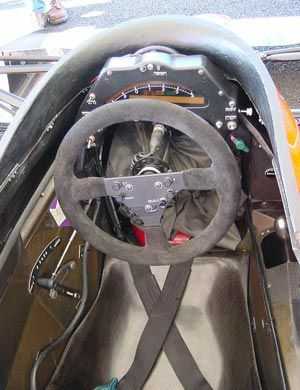 This is the cockpit of the MP4/6. 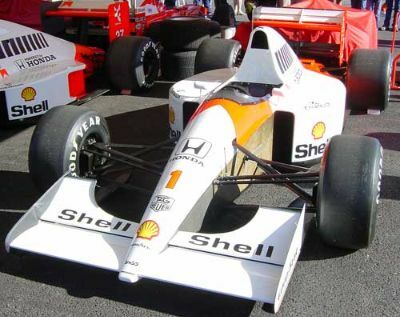 MP4/6 - 1991 3.5 litre V12 Honda power.